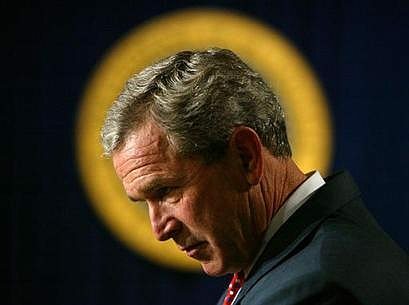 Have you noticed the halos and orbs around the head of President George W. Bush in recent press pictures? You probably haven't because things like that are designed to be seen by the subconscious mind. And genius Karl Rove, the guy whose job is to make our president look good all of the time, knows just what buttons to push to keep his man in the White House. Since the day he announced his candidacy for office, the public relations campaign around Mr. Bush has done a brilliant job of portraying him as something almost superhuman. Since 9-11 and the launching of the Bush War on Terrorism, he has ruled his country under a strange cloak of secrecy and gotten away with it. Protesters who appear on the street everywhere Bush goes, are denied close access. They are assigned areas for demonstration that are out of the sight and camera range of the media. Thus you never see protest signs around President Bush. Even though we have ongoing wars in Afghanistan and Iraq, with foreign and American casualties daily, we are not shown battle casualties, wounded soldiers and rarely military funerals, unless a local television news crew does it. Body bags are starting to come home in nearly every part of the country. And there are those carefully programmed stunts to create photo opts for Mr. Bush. You remember them because they are always quite spectacular. The appearance at Ground Zero while the smoke of the attack was swirling around his head, the landing on the aircraft carrier in a fighter jet to proclaim a victory in the war in Iraq (when in fact the conflict was only just started), the Thanksgiving Day visit to troops under siege in Baghdad, and now the John F. Kennedy style announcement that we are launching a new campaign to send men back to the Moon and beyond. 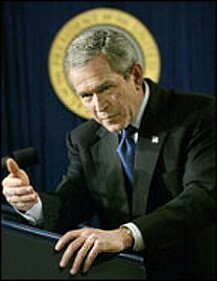 Everything Mr. Bush is observed doing is carefully staged. Everything he says is carefully programmed. It is all designed to portray him as a great leader of a nation under duress. With all of the money being pumped into the Bush coffers by big industry, it is easy to finance these spectacular shows. They are designed to swat off any Democratic presidential contender like a mere insect that accidentally gets in the picture. They haven't got a chance against a machine as well oiled as the one behind Mr. Bush. One of the more sickening tricks, and most obvious, are the pictures emanating from the president's public relations office. Some of them are portrayed on this page for the readers to inspect. If you look at them closely, you realize that they are not accidental. They are staged and Mr. Bush is posing for them. The picture of Bush posing before a lighted cross, under a crown and the word LORD is probably the most pretentious of the lot. Why would someone as elevated in office as our president stoop to such trickery? There is good reason. As writers Renee T. Louise and Ruth M. Sprague explained it: "Television and movies have made us a nation, nay, a world that substitutes pictures for fact. We make stars of actors and heroes of those whose heroism exists only in their publicity releases. "Every day we are shown pictures that the White House Republicans uses to influence our vote. A carefully constructed news item is released to the media knowing full well the pictures the TV outlets will run with it," Louise and Sprague said.